One of my core beliefs in becoming a better investor is a willingness to learn from past mistakes, whether they are from someone else’s or my own. Roughly 2 years ago when I was still in school, I wrote-up Constellation Software, which I believe to be one of the best managed businesses in Canada and on the planet (sorry Valeant fan boys). The track record certainly speaks for itself. (Please see the appendix at the end of this write-up.) I recently noticed that the company had a rights offering and were raising capital with debentures. According to my Capital IQ, Mark Leonard recently purchased ~430,000 shares last month, raising his total stake in the company to nearly 7% which is valued at almost $600MM. If my CapIQ is right, he is currently the third largest shareholder. I can’t confirm the purchase 100% as I can’t find the associated public filing. But that’s still a lot of stock and an extremely bullish signal from an extremely astute capital allocator that models his company under the Berkshire model. Below is my write-up and a blast from the past. Constellation Software Inc. is a global provider of mission critical enterprise software solutions serving a broad range of distinct vertical markets. The company’s strategy is to acquire and manage vertical market software businesses that serve clients in over 40 different verticals ranging from public transit in the public sector to golf clubs in the private sector. Constellation is simply an exceptional business that is trading at a reasonable price. Not only does the business possess excellent economics, it is headed by one of the best corporate management teams in the country in terms of allocating capital. A suburb track record of intelligent capital allocation decisions and a history of strengthening acquired businesses organically have yielded average returns on invested capital of 20% for the past decade and strong maintenance revenue growth in excess of 20% for the past several years. Given the large market opportunity, the high predictability of future earnings and management’s proven track record of executing value accretive acquisitions, Constellation is well positioned to compound its intrinsic value at an above average rate of return for many years to come. Constellation’s clients are small to medium-sized enterprises that generally have less than 1000 employees. These vertical software markets are highly fragmented with many small competitors that lack the capital resources and long-term orientation necessary to provide their customers with an adequate suite of software solutions tailored to meet their specific needs; product development lead times in the VMS (vertical market software) space can last up to 7 years, creating a barrier to entry for potential new entrants. Relative to the rest of the software industry, these are niche markets and almost every vertical market imaginable requires mission critical software in order to run their daily business operations. Constellation’s strategy is to acquire the number 1 or 2 market leader in selected vertical markets for attractive prices and then to grow these acquired companies through organic initiatives and/or “tuck-in” acquisitions – whichever strategy yields a higher return on invested capital. These acquisitions usually come with management teams in place that are extremely knowledgeable about their specific vertical niche, and understand the specific needs of their clients well. With support from senior management in the form of capital and other resources, the ultimate goal is to strengthen these vertical businesses through scale and expansion into adjacent markets. Tuck-in acquisitions make a lot of sense in a very fragmented industry and the decentralized management structure of Constellation allows the VMS management teams with deep industry expertise to successfully pursue tuck-in acquisitions to grow their operating businesses at an accelerated pace with scale. This industry structure is very favourable for Constellation’s strategy. Larger software vendors have a limited presence in vertical markets given the small size of these markets and the mismatch between their relatively expensive enterprise resource planning solutions versus the specific needs of customers in small vertical markets. And as mentioned above, smaller competitors are usually in a weak market position given the large initial investment outlays required for successful long-term penetration. Although Constellation possesses almost every quality imaginable that makes it a fantastic business, it can be summed up by three main points below. One of the keys to Constellation Software’s competitive advantage is its focus on providing proprietary software solutions that are mission critical to its customers. Because of the nature of these products, customers have high switching costs yielding attractive economics to the vendor and result in a very stick relationship with the customer; the time, training and financial resources required to be spent on IT staff and departments in order to have them switch over to another software provider is considerable. Moreover, the mission critical nature of these software solutions exacerbates this opportunity cost since the specific software is needed for the smooth functioning of daily business operations and without this type of software in place, these businesses would simply not be able to conduct normal operations. New software packages introduced by competitors would likely not be cost effective for customers, unless they provided a substantial boost to the productivity or efficiency to the business that would offset the high opportunity cost by a large margin. And given Constellation’s product policy of providing clients with free software upgrades for life and a strong commitment towards post-installation maintenance services, this is unlikely to happen. Arguably, public organizations are even less likely to consider competitor software replacements, given that they do not have to compete in the marketplace and thus are more lenient towards the higher overall costs of sticking with their current provider vs. possible costs savings from switching to another vendor; approximately 74% of Constellation’s 2011 EBITDA was from the public sector. Finally, the company also dominates the competition by being the market leader or #2 player in each vertical market, thus providing them with scale advantages for R&D and a broader product suite over smaller competitors. These factors make it extremely difficult for competitors to steal market share away from Constellation. As mentioned, Constellation’s client base consists of thousands of small to mid-sized businesses, providing the company with a diversified stream of revenues through the large number of customers in more than 40 different markets; this also means that the bargaining power of customers is very low. Historically, customer retention has been extremely high with customer attrition rates of ~4% which is much better than the average software company and implies that the average customer stays with Constellation for 25 years. Ultimately, customers pick Constellation as their software vendor given the company’s deep understanding of their specific needs and a confidence in Constellation having the financial resources to strongly commit to support and maintenance services through offering a “software for life” policy; this is essentially a commitment in providing free software upgrades. As a result, maintenance contracts are typically renewed on an annual basis by customers, which provide Constellation with a high quality, recurring revenue stream. These maintenance and professional fees are a majority of Constellation’s revenue streams (~80%), and are very high-margin and stable in nature. Historically these revenue streams have also been a very stable proportion of Constellation’s revenues, and should remain that way in the future given the large demand for these services. Constellation has a very long runway for growth given the large market opportunity in many vertical markets that are currently underpenetrated by the company. In the North America alone there are over 500 viable “tuck-in” acquisition candidates in different verticals for the company to consider in order accelerate market share growth; there is also a similar opportunity in the rest of the world. Moreover, there is a large opportunity available to expand into new vertical markets where large platform acquisitions are possible. Strong pricing power is possible based upon the points made above about the company having a very captive customer base and the high barriers to entry that exists for new entrants. In addition, Constellation’s software solutions are also a very small part of customers’ overall costs (~1% of customers’ revenues). Over the long-term, the company’s pricing power should remain intact given the necessity for their products and services, the weak bargaining power of customers and the low cost of these services relative to the customer’s overall cost structure. Constellation’s success has largely been derived from exceptional capital allocation decisions made by the senior management team; they have had a suburb record of growing the company by strategically consolidating niche vertical markets at a high rate of return. As mentioned, the company has many operating subsidiaries in different verticals, and operating managers in these subsidiaries recommend acquisitions or reinvestment opportunities to the senior management based upon a return on investment threshold. Within this capital allocation framework, capital is either returned to the main corporate holding company if there is a lack of attractive investment opportunities or is allocated to operating subsidiaries with attractive opportunities; this rigid framework ensures that capital is always allocated to the highest return on investment opportunities. Another aspect of Constellation’s success is its decentralized management structure which creates an optimal incentive system for managers in VMS operating subsidiaries to focus on value creation. A decentralized management structure allows the operating managers to focus on what they do best, and not have their performance constrained by overreaching bureaucracy. Many of these operating managers decide to retain their position heading their respective operating subsidiaries after being acquired by Constellation, thus preserving the deep industry knowledge and customer relationships critical to the success of the overall company. In terms of compensation policy, the majority of performance-based bonuses are linked to ROIC and net revenue growth, and at the operating level, is based entirely on that operating subsidiary’s performance; this is a fair compensation scheme that does not reward or punish an operating manger’s performance based on the performance of another subsidiary. The management team is very disciplined in setting a minimum after-tax IRR as a hurdle rate for all new projects and major platform acquisitions to ensure that there are adequate returns on capital deployed. Management at all levels of the organization are compensated based on two main criteria: profitability and growth. Also there is a strict requirement to invest 75% of an officer’s after-tax incentive bonus into shares of the company which are held for a lock-up period for several years. In addition, a hurdle rate of 5% is used for a minimum rate of return or no performance bonus is paid out, which is usually absent in other corporate compensation schemes. Overall, employees and management are compensated to think like “owner-operators” and the executive management team and board of directors collectively own 42% of fully diluted shares outstanding as of the latest proxy, which is considerable and helps align their interests with shareholders. The President Mark Lenard was a venture capitalist for 11 years giving him a solid background in capital allocation and experience in the operating side as well; this is rare to have in a President as many corporate executives lack the capital allocation skills in order to maximize shareholder value. Although there is little information available regarding his past track record as a venture capitalist, as illustrated below in the APPENDIX, he headed Constellation as the company continues to grow at an impressive rate with high returns on invested capital. He also writes candidly to shareholders about the economic realities of the business in his letters and does not promote the business aggressively to potential shareholders. The company recently put itself up for strategic review in March 2011 and in light of the situation, management looked after minority shareholder’s interests. At the time, shares were trading for less than$70 and several minority shareholders voiced out their concerns about selling the company at an undervalued price level. It is interesting to note that the PE firms Birch Hill Equity Partners and OMERS Private Equity in aggregate controlled half of the board seats at that time, with similar ownership in the company’s stock. The likely reason for the strategic review came from pressure from the PE firms looking for a liquidity exit for their massive stake. Management could have easily succumbed to the pressure of the larger PE stakeholders and sell the company at a clear discount to intrinsic value, but decided not to, demonstrating an interest in looking out for minority shareholders. Given the high growth rate of the business, the key question becomes, is it sustainable for the next 5-10 years? I believe it is given management’s successful track record, the long-term stable cash flows of the business and the large market opportunity that remains ahead; albeit it will be at a slightly slower pace given the increased difficulties of sustaining the high growth rate as the company size increases. EBITDA margins should also be increasing based on scale and further synergies from acquisitions, although at a slower pace than before. In addition, the business should be able to grow through the business cycle as 1) takeover targets are likely to sell at more attractive valuations during recessionary environments, and 2) VMS businesses and public organizations are not significantly impacted by lower business spending given the mission critical nature of the service and the stability of maintenance revenues. Looking back to the period of the last great recession of 2008/2009, the business comfortably grew revenues and EBITDA at greater than 30% levels due to the large amount of growth attributed to acquisitions that helped offset the slight slowdown in private sector organic net revenue growth. On an owner’s earnings multiple, Constellation currently trades at ~18x my estimate for 2013 owner earnings and ~11x my estimate for 2013 EBITDA which unfortunately doesn’t provide a large enough margin of safety at the current price level. 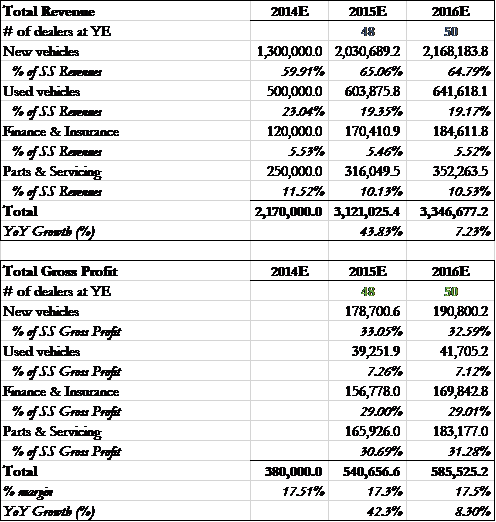 I have a 1-year target intrinsic value range of $132.56-$150.69 based on a blended multiple valuation of 13x 2013 EBITDA and 20x 2013 Owner Earnings. I have also run a conservative DCF that results in an implied valuation of 13.33x 2013 EBITDA and 22x 2013 Owner’s Earnings. My estimate for 2013 EBITDA margins is 22.2%. Firstly, adjusting for amortization expenses make sense given the high likelihood that the economic value of the intangible assets of the business have actually been growing instead of declining over time; these intangible assets came purely from acquisitions made by the company. Since the company has been able to grow their maintenance revenues organically, even during the great recession, the value of these intangibles have likely increased rather than decreased. Economic goodwill should also be increasing over time as accounting goodwill is not representative of the economic realities of the business. Secondly, the company’s true earnings power has also not been realized yet. Near term earnings and EBITDA margins are likely below normalized levels given the amount of time it takes for synergies to have a sizable effect on business performance. For example, margins are likely to improve from the PTS acquisition done in 2009; right now, PTS is at a 19% EBITDA margin; Company-wide EBITDA margins have been expanding over the past several years from 14.2% in 2005 to nearly 22% as of 2011. Thirdly, the company can grow its revenues organically with little to no incremental capital and with extremely high returns on net unlevered tangible assets deployed. VMS businesses such as Constellation tend to operate with negative working capital as a result of the collection of maintenance payments and other revenues in advance of the performance of these services. 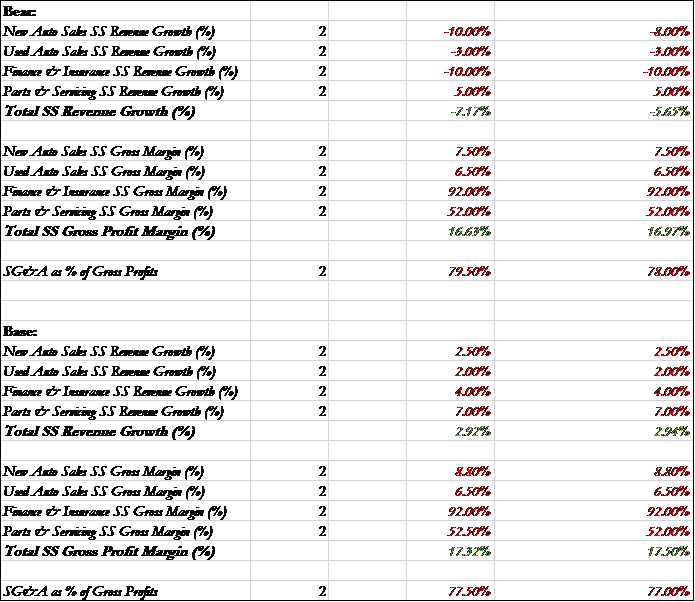 Lastly, I believe my valuation is slightly conservative despite using premium multiples. I’ve assigned a normalized tax rate of 35% despite the fact that around 20% of the business is outside North America and subject to lower tax rates; also there should be continued tax deductions from goodwill created by future acquisitions. I have also used positive working capital assumptions for the business to maintain itself into the future, taking into account a trend towards higher hardware based sales. In summary, I recommend purchasing shares near $100. 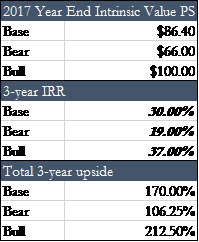 At that price you can obtain an extremely high IRR business at 65 cents on the dollar with intrinsic value growing comfortably between 12-15% longer-term. You would also be buying into a company with great economics, probably one of the best capital allocation teams in the country, ample growth opportunities well into the future, and at a nice discount to intrinsic value which is growing at double digits year after year. Under these circumstances, it is very difficult to envision a scenario that would lead to a permanent impairment of capital. Why is the business undervalued? An example is that they acquired Public Transit Solutions (PTS) from Continental AG in 2009 for a mere $3MM in cash; Since the acquisition, PTS has contributed $33MM in operating cash flow. Obviously you can tell from my valuation work that I didn’t invest in the company at the time. WHAT A HUGE MISTAKE! Hindsight is always 20/20, and I always view investing through the lens of a “probabilistic world”, but I’m pretty certain looking back now that my valuation was overly conservative. If we do the math the 2-year IRR of this investment would have been ~87%. Even if we assume constellation is 50% overvalued today (highly unlikely and laughable), this was a terrible mistake of omission. In fact it might even be a great buy today. I think what happened here is that I underestimated the upside because I wasn’t willing to put that “premium” on the stock for an exceptional CEO and an exceptional business. The trick here is that, there simply aren’t that many “Outsider” CEOs in the first place, so when I did my typical analysis of this company, I did a bad job of assessing the long runway of this business and the future cash flows. This was probably a lapse in my judgement since I take the view that the vast majority of good to great businesses are typically richly priced and trade close to full value (a cheery consensus with not a lot of uncertainty), and I lumped Constellation into this “category”. As a value investor I try to not be overly optimistic in projecting business performance, as I believe it’s in human nature to be optimistic with projections. In short, I didn’t think hard enough about the margin of safety and realistic upside scenarios for this particular case. This is why valuation is much more of an art than science as there are always many moving parts to consider and not just simply slapping a multiple on a business without much thought. In fact the most important piece of valuing a company is understanding the nature of the business, not adjusting figures in the 20th tab in an excel model. There may be only a handful of these types of publicly-traded companies operating in the world today, so if you’re confident that an extremely high-quality business is going to compound intrinsic value at 35%+ for many years to come, don’t just slap on a 20x multiple like I did. I think 30x+ made much more sense. With this type of business run by a great capital allocator, I should have been much more confident about predicting the future cash flows of the business. Let’s just say the “tail risk” for the bull case was much more fat than anticipated. Enterprise software is also an extremely scalable business model. Constellation is a compounding machine, and I don’t think these past 2 years have changed this fact. Another thing, although probably a bit more minor, was taking into account the incremental value from recent acquisitions. Constellation is an extremely acquisitive company that closes small deals every few weeks (reminds me of Malone rolling up rural cable systems during the TCI days) so the GAAP reported numbers are always messy. But if you believe the management team are extremely savvy and disciplined in capital allocation (it’s all about the target return on capital), then you can be confident that these acquisitions will be extremely accretive. I certainly would rather own this business over Valeant, but that’s just me and my circle of competence. Buffett has always said that his biggest mistakes were errors of omission rather than commission. I think this is a great example of myself making that mistake. Note: As I was writing this up the stock has gone up nearly 30% since the panic low last Friday. I believe the shares still remain very undervalued and provide a highly asymmetric risk/reward scenario. All calculations are based on a $39.20 share price. AutoCanada is what Peter Lynch would call a “fallen angel” and one of the fattest pitches I see today in my small-cap Canadian stock universe. I had bids set last Friday as the shares plunged to around $32 that unfortunately were not filled; that was a very costly mistake, as the shares have surged up nearly 30% since then! AutoCanada was a high-flying Canadian stock market darling that experienced an atmospheric rise last summer on the back of a string of accretive acquisitions and strong growth in Canadian retail vehicle sales. The main headline risk now is that the precipitous fall of oil prices will have a negative effect on the Alberta economy and consequently falling employment in that region. In fact if we compare AutoCanada’s share price history over the past several months you’ll notice that it’s largely been trading in sync with WTI. Although I believe a slowdown in the Alberta economy is very likely, I believe investor fears over AutoCanada’s exposure are way overblown. Mr. Market’s overreaction and manic depressive behaviour has rewarded us with a current share price which provides a tremendous opportunity for investors to buy shares in an extremely well-run auto retail growth business at a large discount to intrinsic value. Even in the unlikely event that nationwide new vehicle sales decline double-digits and AutoCanada closes no further accretive deals in 2015 (very unrealistic, nearly impossible based on a confluence of factors that I will explain) – shares are still worth between $47 to $51, providing 19% to 30% upside one year from today. In my more realistic but still rather conservative base case scenario, the shares are worth $61 to $65, providing 1-year upside of 56% to 65% upside. AutoCanada is a high-growth story and the only publicly-traded Canadian franchised auto dealership group. The business was taken public in 2006 with the thesis of tapping into the public markets to consolidate the fragmented Canadian automotive retail industry. Since the company’s IPO, AutoCanada has acquired or opened 34 additional dealerships and expanded its lineup of partner OEM brands to 19. Last year alone the company acquired/opened 16 dealerships as growth accelerated. The founder and new chairman, Patrick Priestner, was a university dropout who started his career in the industry as top salesman selling Chrysler branded cars at the age of 17 in Alberta. 1) Despite AutoCanada’s relatively large dealership exposure to the vulnerable Alberta economy, I estimate that only 33% of AutoCanada’s current 48 dealerships are truly “at-risk” to Alberta’s slowing oil sands’ economy and consequently weaker employment. Furthermore, if we further digest the news of large CapEx budget cuts announced by the E&P companies in Alberta’s high cost oil sands, then we can reasonably assume that fleet sales (corporate sales) should be disproportionately negatively affected in a business slowdown relative to retail sales. Fleet sales are very low margin (typically less than 1% gross margins) and thus should have a miniscule effect on consolidated gross profits even if we assume large volume decreases in this category. Due to this favourable business mix-shift in the event of rapidly falling new corporate vehicle demand, I argue that the situation is less dire than what is perceived by the market. 2) I believe the bears (or panic sellers?) in general under-appreciate the resiliency of the franchised multi-dealership business model and especially AutoCanada’s track record of achieving best-in-class operational efficiency in their parts & services (P&S) segment. This segment is basically the bread-and-butter of every franchised car dealership should perform strongly even in an economic downturn. 3) Despite AutoCanada’s heavy Western Canadian exposure, the business is quickly diversifying in terms of acquiring new OEM partner brand dealerships outside of Alberta. The size of these acquisitions have been growing larger as the business scales its dealership base which should help mitigate the risk of declining profits in the event of any serious downturn in the Alberta economy. 4) I believe the market is pricing in the absolute worst case scenario where AutoCanada will do no more acquisitions or open up anymore dealerships (highly unrealistic) over the next several years. With a highly fragmented Canadian auto industry (~3,500 dealerships nationwide), acquisition targets remain plentiful and this predictable growth cannot be ignored. In short, management’s proven strategy of high-quality growth by acquisition remains intact, and should provide a long runway of multi-year growth compounding at high rates of return well into the end of this decade. 1) What’s really at risk? Alberta, like many Canadian provinces, is quite big, and although is very reliant on the oil industry, there are more moving parts to consider. In fact, slightly more than a quarter of AutoCanada’s Alberta-based dealerships are located in Grand Prairie, which is an area that is more exposed to natural gas, forestry and the US housing industry than to oil. The rest of the company’s 22 Alberta dealerships are located in Calgary, Edmonton, Sherwood Park and Ponoka. Due to their employment demographics, these dealerships should be considered more exposed to a slowing local oil sands economy. It’s all about the gross profit, not the sales. I believe the slowdown in total new vehicle sales should disproportionately affect fleet sales (corporate sales) more than retail sales. As mentioned, fleet sales gross margins are very low and are typically less than one tenth of new retail vehicle gross margins. We can assume that the E&P companies will be cutting back on purchasing light pick-up trucks on the back of falling oil prices and budget cuts. In fact, if we look at the most recently reported quarterly results (see below), we’re already seeing same-store fleet sales volume decline considerably YoY on a 3 month and 9 month basis. I believe AutoCanada’s new fleet sales are more cyclical relative to new retail sales, especially given the company’s exposure to the Alberta’s oil-centric economy. Looking at same-store-sales (SSS) in the latest reported quarter can give us a bit of a clue in what to expect in 2015 if we assume the cycle turns in Alberta. 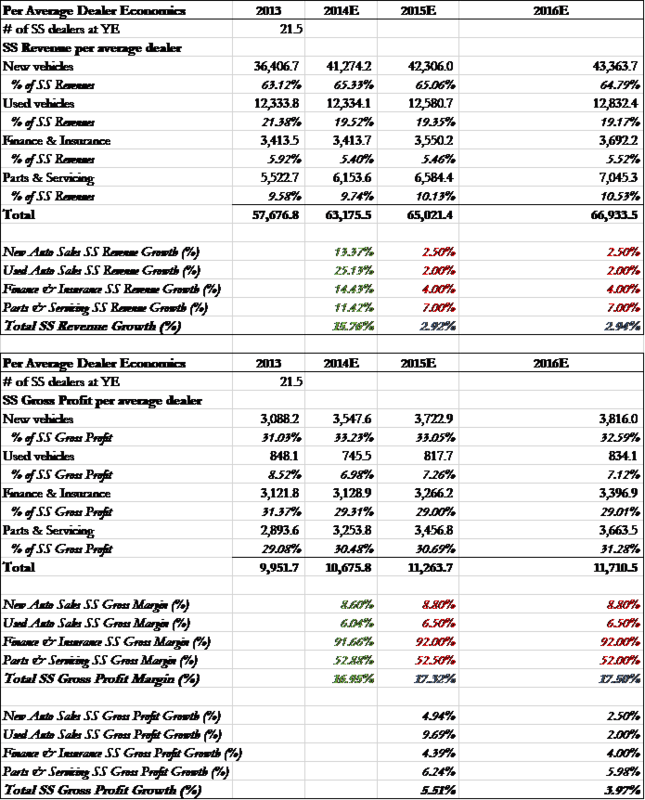 As we can see, even with the sizable drop in new fleet volume and fleet SSS, same-store new vehicle gross profits still managed to grow 20.5% and 7.8% on a three and nine month’s basis, respectively; as long as we assume new retail vehicle ASPs remain stable or increase slightly (like they have been), small increases in new retail sales can offset larger fleet sales declines. In the event that even new retail sales volumes decline, I believe it’s reasonable to assume that AutoCanada’s used vehicle gross margins and gross profits will hold up strongly even in a severe downturn, supported by the fact that consumers and enterprises typically trade down to used vehicles to save costs during tougher economic times. What’s interesting is that even if we look at the latest auto sales data that was released in January 15’, Dec 14’, Nov 14’, etc. there hasn’t been any real indication that there’s been any significant weakness in Alberta vehicle sales. Even if we assume there should be a slight lag in the industry data following oil price movements (oil starting crashing last July), November and December industry sales were both up 4.8 and 4.4 percent YoY, respectively, and nationwide industry sales have also been strong. The provincial data hasn’t been released in January 15’ yet, but overall industry sales are up and light truck sales have been outperforming. Given the recent data, it’s rather perplexing as to why retail sales haven’t been strongly affected in Alberta yet, and there’s even reason to believe that the lower oil prices have been incentivizing consumers to buy larger vehicles. My conversations with some of AutoCanada’s dealers largely confirm this thesis that new retail sales remain strong. Finally, the auto dealership model in general has quite a variable cost structure, helping reduce costs in a downturn. The vehicle sales and F&I segments that are most vulnerable to the cycle have the least operating leverage due to the highly variable nature of a car salesmen’s compensation structure. I) I believe the franchise dealership business model is much more recession resilient than what the market gives it credit for. Despite the company’s cyclical exposure to new vehicle sales, parts & servicing (P&S) is where the real money is made, where gross margins are typically 50%+, are much more recession resilient, and recurring in nature. P&S is the most important segment for any auto retailer, and based on my research AutoCanada’s operating metrics are among the highest in the industry. If we look at AutoCanada’s operating history, the business has consistently achieved high “absorption rates” at near 90%, a metric which measures operational efficiency in the P&S segment. P&S is also a relatively counter-cyclical segment as consumers tend to keep their cars longer in downturns, and thus require ongoing vehicle maintenance and replacement parts. III) The P&S segment has the most operating leverage and highest incremental margins, and this is exactly the segment you want the most leverage as it is more predictable and recurring relative to new vehicle sales. I conservatively estimate that around 50% of P&S gross profits flows through SG&A. This segment also has good pricing power as vehicles repair and maintenance work becomes increasingly complex on newer vehicles and warranty contracts continue to lengthen. Light trucks which AutoCanada’s Alberta-based dealerships sell a lot of typically require more maintenance work on a more regular basis due to heavy usage compared to passenger cars. IV) OEM franchised dealerships should continue to take servicing and repair market share from mom-and-pop repair shops that do not invest in the sophisticated equipment and software required to perform repairs and warranties on today’s increasingly complex vehicles. Each OEM requires specialized equipment for their own vehicle models which should freeze out mom-and-pops that under-invest in these areas. 3) This time is really different, if there is a “this time”; 2009 is a poor precedent. -Finance & Insurance (F&I) is a sizable portion in consolidated gross profits (90%+ gross margins). Decreased in FY2009 because of tight lending conditions – the company’s largest 3rd party financing partner, Chrysler Financial Canada, declared bankruptcy so they had to switch to GM Acceptance Corporation, which today is the newly re-organized, well-capitalized Ally Financial. -Not core to the thesis but industry analysts are still forecasting strong light vehicle growth in Canada (~1.8 million vehicles for 2015). The US numbers look strong as well. I believe despite the bear’s concerns about falling employment in Alberta, lower oil prices and the plunging Canadian dollar should help the company’s dealerships outside the province. Also keep in mind that this time the reason why oil took a hit was largely supply-driven. In 2008/2009, it was largely a demand-related shock. I think the recently reported industry data is already confirming that the sky is not falling and light vehicle sales across the country will remain strong. Despite having 22 out of its 48 dealerships in Alberta, we should really be focussed on new retail sales volume per dealership. Last year AutoCanada acquired a set of 2 powerhouse BMW/Mini dealerships in Quebec, which marks the first time they’ve expanded into the BMW/Mini OEM brand and into the French Canadian province. 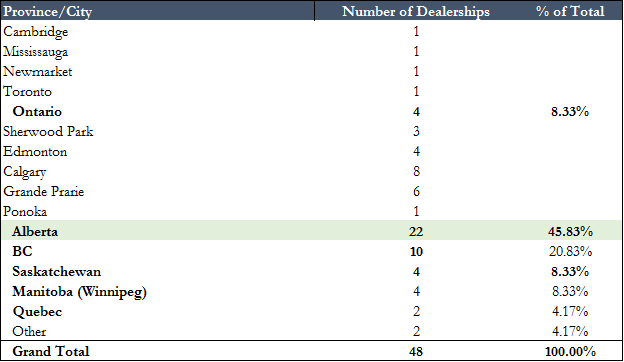 These dealerships are around 2.5x the size of an average AutoCanada Calgary-based dealership and combined they sold 3,860 and 1393 new vehicles and used vehicles, respectively, in 2013. These figures alone represent ~65% of all the vehicle sales volume of AutoCanada’s Calgary-based dealerships. AutoCanada’s new Montreal BMW/mini dealership alone volumes ~60-65% of all the BMW/mini cars sold in the city. What’s more important I think is BMW/Mini’s acceptance of AutoCanada’s public dealership model, which provides further diversification away from AutoCanada’s heavy D3 exposure. I believe the warranty and maintenance work for higher-end German vehicles is very attractive. Finally, if we look at AutoCanada’s OEM brand mix, it’s heavily weighted towards the Detroit 3 and Japanese brands. I believe the luxury brands will be more at risk compared to these midline brands if we head into a slowdown. The company only has 1 Volkswagen dealership in Calgary purchased in 2014. I believe the market currently under-appreciates AutoCanada’s long runway for growth driven by consolidating the fragmented Canadian auto franchise dealership industry. Based on my research, there are ~3,500 Canadian dealerships and more than 2,000 single owners. According to PwC, around 70% of auto dealership owners in Canada are either looking to retire or semi-retire, and selling their dealership is an attractive option. However, there are OEMs that restrict public ownership in Canada; Ford, Toyota and Honda are such brands and currently represent about 28% of all dealerships in the country. 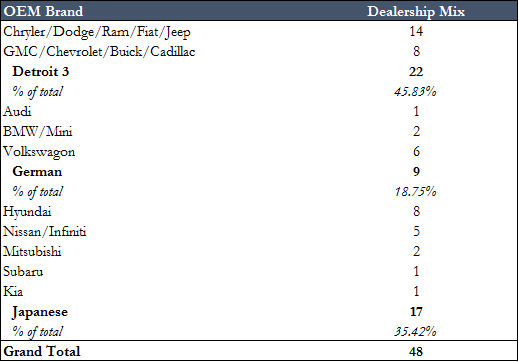 Even if we factor in these restricted brands, AutoCanada’s market share (by dealership number) is still less than 3% of all publicly-allowed dealerships in Canada. Due to the sheer number of acquisition targets for AutoCanada, these restrictions still do not derail the growth by acquisition thesis that should last well into the end of this decade and beyond. Also, it’s very possible that these restricted brands may eventually allow public ownership Canada, where it has already happened in the US. I this scenario as an additional free option to the growth thesis. -Only a few privately-held dealerships of comparable size are competing for deals (Dilawri Group is the largest in Canada), and since they are private, they’ll most likely focus on acquiring non-restricted brands, so I believe given the sheer number of targets and the overall succession issue, average purchase multiples should remain reasonable (within 4x-6x EBITDA depending on the location and OEM brand). -Fiat-Chrysler has emerged post-bankruptcy as a strong, re-organized company with a good balance sheet that continues to take overall market share in Canada (only second to Ford). If we look at just light vehicle sales, Fiat-Chrysler actually has top market share at ~18%. -OEMs were concerned about dealership group concentration in the past when the industry was much more competitive (some D3 franchised dealerships were closed down during the last recession and have emerged as independent used car dealerships), but now they are more focused on dealership profitability and supporting their P&S departments by including longer warranties and service plans on vehicle purchases. This is a rather good retail business. They have good dealerships in good locations and generate a lot of free cash flow. Inventory risk is extremely low. The overall cost structure is quite variable for a cyclically exposed business. Where there is operating leverage it is where you want it to be (in P&S). This segment continues to take market share from independent garages and has good pricing power. There is virtually no internet disintermediation risk. The business generates high returns on invested and tangible capital; I estimate that AutoCanada generates around mid-20s on pre-tax returns on capital employed. I expect the return on invested capital to continue to improve as they ramp-up newly acquired dealerships and continue to leverage their fixed costs as they scale. Anytime we have an extremely acquisitive company we need to make sure that management have considerable skin in the game, a strong track record of value creation, and incentives properly aligned with shareholders. Canada One Automotive Group (CAG) is a privately-held dealership group controlled by AutoCanada’s chairman and founder Mr. Priestner who has a ~87% equity stake in CAG. CAG owns one Ford, one Lexus, and one Toyota dealership (currently OEM brands that do not allow public ownership in Canada but will most likely be acquired by AutoCanada if this restriction is lifted) and has a nearly 10% stake in AutoCanada shares. If we do the math, the value of Mr. Priestner’s current equity stake in AutoCanada via CAG comes out to roughly $87 million. -CAG recently sold several GM dealerships to AutoCanada with Mr. Priestner retaining a 15% ownership stake with voting control as owner-operator (a requirement by GM Canada). I believe having the seller retain partial ownership post-sale better aligns the economic incentives between the seller and acquirer when it comes to improving operations post-acquisition. -The current President Tom Orysiuk was formerly AutoCanada’s CFO when he joined as the CFO of Liquor Stores Income Fund and based on his track record he understands good capital allocation. -Raised ~$200 million in equity financing when shares were near $78 last summer; this represents more than 20% of the entire market capitalization today! At $78 per share, essentially they were diluting the equity at ~32x 2014E earnings, ~26x 2015E earnings, and using the capital to purchase dealerships at 4-6x EBITDA. So issuing equity at a little over a 3% earnings yield to purchase assets at a more than 10% earnings yield. You can call this a “roll-up” if you want but I think it’s a pretty value accretive roll-up. Furthermore, the company is buying real estate at attractive cap rates at 10% or greater; in fact I believe the 11 real estate related-party transactions that the company bought from CAG late in 2013 were purchased at close to a 10% cap rate. I would have much rather preferred it if management funded these purchases primarily with non-recourse debt. They could have funded these purchases primarily low cost mortgages at 4-5%, so essentially getting a high ROE with very low cost financing. Some observers have pointed to CAG’s stake being continually diluted down over time via secondary offerings as a concern. For example, at the time of the large $200 million equity issuance last summer CAG exercised its over-allotment option and diluted its stake down to ~9.5% in AutoCanada today. I think we have to put the dilution and over-allotment in context. The stock price was basically trading at 32x earnings, not exactly a low multiple even for a high-growth company such as this one. If I were the largest shareholders I probably wouldn’t mind taking a bit of money off the table given the atmospheric rise of the stock price since the 2009 lows and especially given that the shares were likely overvalued. In retrospect, most of the cash raised at that high share price has been used to acquire additional dealerships at low multiples, so I believe it was a deal in the best interest for all shareholders. I think about it this way in terms of value creation: we’re basically getting a smaller piece of a much larger pie. One thing I should point out is that the over-allotment generated around $203 million in additional gross proceeds for the CAG shareholders. So the only thing that gives me pause or slightly concerns me is that I didn’t see any insider buying by Mr. Priestner when the stock tanked to the low 30’s. I don’t think this is a deal breaker to my thesis, but certainly a bit of a question mark. -President says they are buying dealerships at 5-6x pre-tax income; if they purchased the 2 BMW/Mini dealerships in Quebec within this valuation range it would be well below the range luxury brand dealerships typically sell for (closer to 6-7x EBITDA). They have a track record of improving operations from acquired mom and pop dealerships, leveraging best-in-class IT practices such as CRM, sharing inventory within a close proximity network etc. For 2014 the annual incentive plan was 40% weighted to adjusted free cash flow per share, 30% weighted to adjusted gross profit, and 30% was discretionary. In the prior year instead of adjusted gross profit the performance metric was adjusted return on capital. It’s not a deal breaker to me that they changed this metric but I will be seeing if they eventually put ROC back into their annual incentive package which properly measures an acquisitive company’s performance. They typically track this metric in their filings. Executive annual compensation remain a small % of the value of their holdings in the company. In summary, I believe the AutoCanada’s management team are among the best auto retail operators in Canada. They have a long successful operating track record, and are allocating capital well. My only remaining concern is the absence of large insider share purchases at these current trading levels. 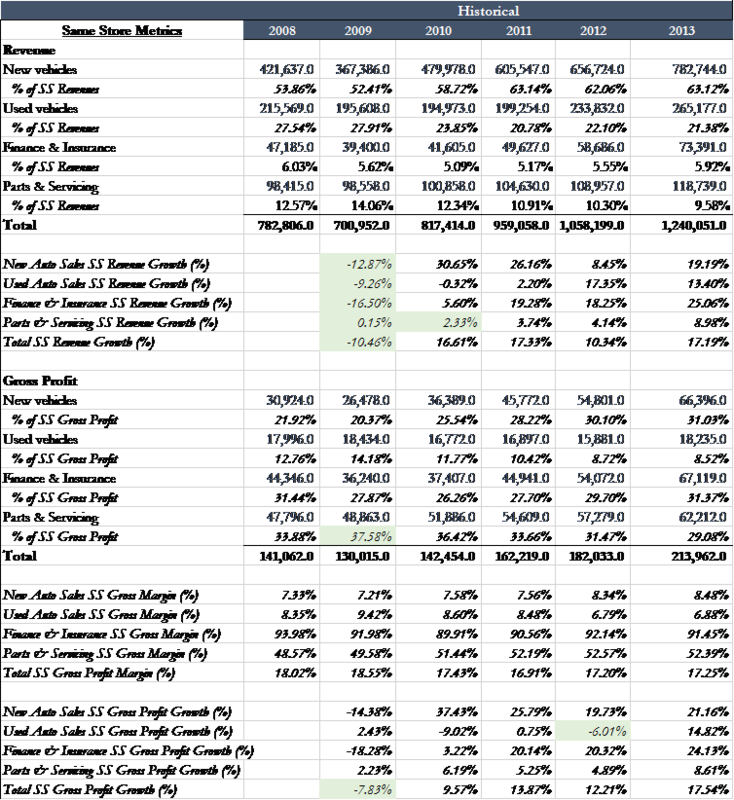 Since this is such an acquisitive company that closes deals almost every quarter it’s very difficult to project growth even on a run-rate basis, but I have basically modelled same-store metrics and applied them to the total number of company-owned dealerships on a forward basis. It’s a bit complicated but I believe it is a good, conservative rough estimation of intrinsic value. Bear Case Scenario: I have modelled the key drivers for an overly pessimistic, unrealistic “bear case” scenario. 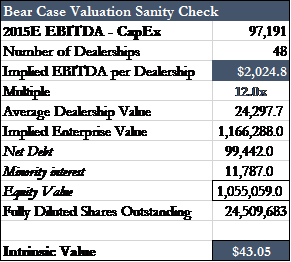 I also sensitize the bear case intrinsic value with a “no acquisition” scenario that assigns 0 value to the incremental FCF that will be generated (basically assuming the cash just accumulates on the balance sheet) and an acquisition scenario with 6-8 deals (still below management’s annual guidance of 8-10 deals per year) closed in 2015. For all my key driver assumptions please see the appendix. Based on my conversations with some of AutoCanada’s dealers, I believe ~50% of gross profits from P&S should flow through SG&A; (eg. if P&S gross profits grow by 5%, EBIT should grow by ~7.5%). I assume same-store P&S gross profits grows at low-to-mid single digits which I believe will prove very conservative. SG&A: I model this at 79.5% of gross profits, a nearly 200 bps increase from 2014E levels. I believe this is an extremely conservative assumption especially after the fact that the company purchased the real estate of 11 of its dealerships that it used to lease in late 2013; this should decrease their lease expense ~$10 million on an annual run-rate basis. Also they now have 48 dealerships which is ~50% more than in 2013 year end. Some cost savings and synergies on these additional dealerships acquired should be easily realized. I’ve layered in 6-8 acquisitions to my valuation with the deal assumptions shown below which conservatively leads to a few dollars of incremental value per share. I also have a scenario where the company closes no deals which is essentially assuming that the ~$65 million in incremental FCF that will be generated in 15’ piles on the balance sheet (highly unlikely for a management team that have consistently allocated capital at a high rate of return). I took my bear case projected adjusted EBITDA figure and divided it the number of dealerships to get the average EBITDA per dealership. By this measure, the implied average EBITDA per dealership is ~$2 million. I simply believe this figure is far too low. If we look at the average deal size over the past 25 or so acquisitions that company has completed, and assume a 5x-6x purchase multiple range (mid-to-upper point range of management’s guidance) for these acquisitions, it implies that the most recently acquired dealerships should be generating on average at least $2.5 – $3 million in EBITDA. Also, remember that these dealerships haven’t fully gone through the 2-year ramp-up period, where better operational efficiency, and cost and revenue synergies can be easily realized. Therefore, I believe my bear case sanity check supports the case that this scenario is overly conservative. I believe AutoCanada should trade at a slight premium (1 – 2 turns) to Asbury Automotive Group, AutoNation and the other US publicly-traded auto dealership groups (which are arguably undervalued as a whole sector). These comparable companies are trading at around 15x-16x forward P/E multiples, and 10x-11x forward EBITDA multiples and should have lower growth prospects. On an absolute basis an 8% FCF yield is quite attractive for this business. Another way to look at the current valuation is that we’re essentially getting a lot of future growth for free. The Bull Case is straight forward: I think this business could potentially be worth $100+ per share 3 years from now. This implies a valuation of 29x – 30x 2015 free cash flow per share of $3.30 – $3.45. The key drivers here are an acceleration in accretive deals as the business scales and P&S gross profits continue to grow at high single-digit rates. I don’t believe this scenario is too far out of reach. Why does this opportunity exist and what’s my edge? 1) The stock doesn’t screen well on an EV/EBITDA metric and appears over-leveraged given the large floorplan financing. 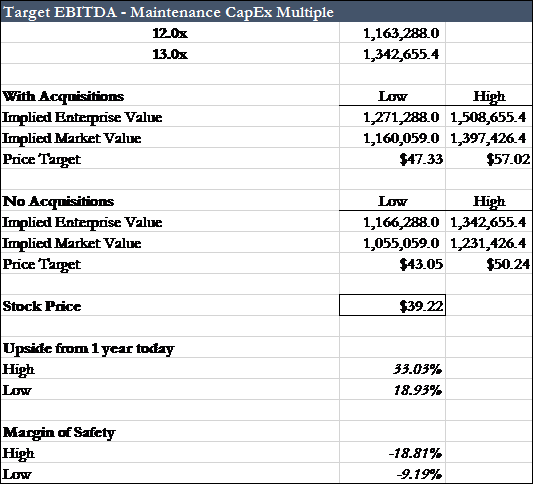 EV/EBITDA should be adjusted for floorplan financing, which I treat not as debt but a use of working capital. AutoCanada’s floorplan financing has consistently been below inventory levels, indicating that the dealerships are turning over inventory efficiently within the 45-60 day interest-free period and that there is actually excess cash hidden in the floorplan. 2) This is very acquisitive company so the GAAP accounting is very messy. Obviously, the company has been making a lot of acquisitions, which obscure the true profitability of the business. Projecting forward earnings has to take into account both organic and inorganic growth which isn’t a simple task. The company also doesn’t break out the same-store figures from the growth from acquisitions. -Similar to my DirecTV idea, I really don’t see anything that can “torpedo” my thesis. Even if we were to assume that Canada enters into a very deep recession, acquisition targets should remain plentiful and could likely increase due to owners worried about the cycle turning, and as mentioned AutoCanada’s cost structure is very variable. The only scenario I see that can cause permanent impairment of value at this price is management destroying shareholder value. Given the arguments I made above, I believe this is an unrealistic scenario. These things are not important to my thesis since I believe that the shares are trading at such a discount to intrinsic value that 1 year from now I expect the stock to be trading much higher. I would also like to hold this business for the longer-term as long as it remains reasonably valued and provides a high IRR given the long runway for high-quality growth. Also as highlighted above, I think it’s a pretty good retail business that I would be happy to own longer-term. 1) WTI begins to sharply recover, and ACQ follows suit. 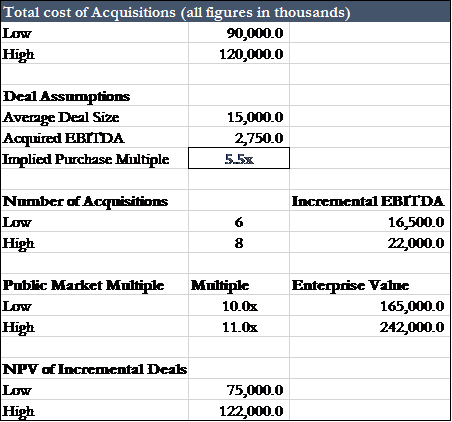 2) Announcement of large accretive deals; the company definitely has the balance sheet to execute. 3) This is a great example of how prices are much more volatile than underlying business values; prices can overshoot to the upside and to the downside; the core growth thesis remains intact and once the markets starts shaking off the oil plunge fears this stock can take off very quickly again and re-rate to a 20x multiple to properly reflect the growth prospects. This is a very likely scenario since this is a high-growth dividend-paying stock that should attract a lot of interest again especially as Bay Street will continue promote the stock. 4) Monthly industry data continue to point to strong performance and less muted effect of lower oil on vehicle sales in Alberta. 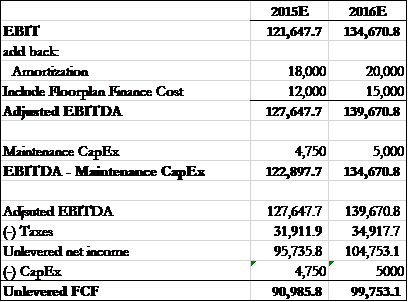 5) Fiscal year 2014 year end results will be reported in March which will show strong inorganic and acquisitive-driven growth. 1) This is a high-quality compounder with plenty of growth that has temporarily fallen out of favour – a classic “value investment”. 2) We have a fantastic management team focussed on driving shareholder value, are well aligned with shareholders, and are experienced in the industry with a suburb operational and capital allocation track record. 3) The bear case has no legs, and even if it does, there is virtually little to no downside at current trading levels. In fact there is plenty of upside since we are getting such a bargain price as until the market comes to its senses. I believe this situation exemplifies Monish Pabrai’s famous quote: Heads I win; tails I don’t lose much.